In this video, Ed D'Arata, Mini Mania's SU Carburetor genius, goes through the differences between the various SU Carbs found on classic Minis, Sprite & Midgets, and Morris Minors. Use this handy guide to identify what carburetor is on your classic. Hello and welcome to the Carb Shop. 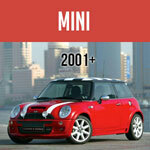 I'm Ed Darada I'm the sales manager here at Mini Mania and also do all the carburetor rebuilds. And in today's session we're going to talk a little bit about how to identify your SU carburetor. 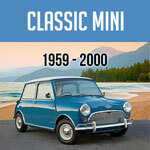 We're going to pretty much focus on the SU and inline Mini, Sprites, Morris Minors a little bit just so that when you have a carburetor underneath the hood you'll kind of know what to look forward to get a proper kit or to get a replacement carburetor. Just a quick crash course on SUs. The easiest way of course to identify one is if you have the identification tags which are on the carburetors and usually they will be on this case a HIF44 usually up on the dash pot or on an HS4, one of these, or on the side bolt. Usually the earlier ones are the small triangular-shaped ones. You usually have like an AUD number, the bigger later ones usually an FZX number. If you give me a call with that number we can look on our application guide and sometimes tell you what it fits on the model and the make or you can actually put that number in Google and a lot of times it'll come up and tell you what it fits. So that's one way, the best way to do it and don't be fooled about what comes in a Mini because if you go by the application guide you have HS2 which is a very small inch and a quarter carburetor, you'll find that also fits an 850 you'll, find them on 998s and the other way around. You'll actually find an HS2 on a 998 also and HS4, which is the inch and a half that's also going to be on found on an 850, which is just hard to believe. It's a lot of cooperation. So I'll give you a quick crash course on the size of SUs they go by the early ones HS2, HS4, HS6, the two would be an inch-and-a-quarter. The 4 is an inch-and-a-half, the 6 is inch and three-quarter. The later styles from these and the HIF they actually converted it to a metric size which would be HIF 38 which would be the bore size here which determines your CFM rating, HIF 44 inch and 3/4. So we're going to get right back into it. So when you pop your hood you're probably going to see something, looks kind of like this, you can have a carburetor with a dashpot sticking up and a lid you pop off the air cleaner like that and by golly they all look pretty much the same. Okay this one has put it this way and this way so how do you tell? The easiest way to tell is by the angle right here where the air cleaner dome comes down, the gloves are on the HIF 44 is going to be kind of square, the 38 you'll notice is a rounder air cleaner lid that fits right here the air dome. That's the easiest way to tell other than that that - the dash is the same, the throttle linkage is the same, air linkage is about the same but the actual air cleaner is a little different here just because it's square and it's rounded that's the best way of how to tell them apart. Now some of these carburetors, they've been converted so that you'll find this carburetor HIF44 on a 4 bolt flange manifold, sometimes you'll find it on a two bolt flange manifold and it will still fit or one that's one piece you can do that too that will still fit. You can put either one a 44 or a 38 on. And I'll go grab a HS4. And it’ll worked vice versa, you can actually put an HS4 inch and a half carburetor on a four studded 44 38 manifold or we go out of this one, two bolt or diagonal bolt, either way. Now we make kits for conversions also, we have MMKT 0400 which would be an HIF 44, it'll come with intake manifold, the proper spacing, a button or bracket, cables, the air cleaner, so everything you do to convert it over from HS4 if you want to do that. I think that's about all we have to cover on this model of the 44s and 38s. Also on the carburation here, what the HS and the HIF, the difference being the tube, the HS series has a side ball float on it which has the fuel line coming over jet 2. The HIF series has an internal flow that's all built inside here, much superior carburetor internal components also has rubber seals on the throttle shaft so they don't leak air like these receptacles do. Okay next section here is going to be the HS4 carburetors, came in two varieties. Usually the earlier style had a jet tube that's either red or black they will come using the kit as red or the black same size. There are both 90 thousands jet tube diameter so either one it works so that'll be fine. Now to identify it on the car when you look at it here which one it is, between HS4 and a smaller HS2 obviously the dome size is different of the damper because HS4 is larger but the main thing to look for is the screws this one has two mounting screws on the top, HS4 has three mounting screws. So I can't eliminate it, right there HS4 HS2. The other thing you want to look for is the early and later style the early style like I said had the red fixed jet tube standard in it and usually the needles inside are a fixed needle as opposed to a swing needle which is a spring matter one. The later ones on the minis we see about 70s and later use what's called a waxed tab. This is the English poor version of emission control device. But what it is, is a wax pellet inside of the wax tab here that raises and lowers the jet tube as the temperature raises and lowers so it controls the fuel mixture. Very easy to tell the waxed has a big old silver thing on the bottom so when you call and say what kit do I need or which carburetor do I need the main thing look for is on the bottom. You're going to have a red or black jet tube assembly, or a wax stat. That'll be the brand-new wax tab, you may buy it separate or you can buy it in the kit. Now there's a couple of different conversions that I like to do I take the later model waxed tab style and I convert it to the earlier style which a lot of people like because it's a little more consistent it doesn't float up and down and give you variances like these do. So with this kit here this one's got an arm on it which actually goes through this part of the jet tube down here, well this one right here actually, and it'll fix up to the linkage here the other one actually has what I like better, they have this little bracket and you put it on with the screw right through there and that will support a little ball an arm that comes off the wax tab. So you're going to replace this whole thing but you're going to use the same arm and coupling that you use on this linkage here, very clever, that's a IZX 1111A, so you can convert that over for a wax tab style and its actually a little cheaper. I think that's all we need to do on covering the how to identify on the HS4 versions and of course once again you'll see a combination of manifolds out there, you could have a 4 bolt, you could have a four bolt with just two studs, you could have a diagonal, and, one-piece manifold with exhaust attached or it could be a separate with a separate exhaust header on there, or you could have headers on there, any combination will probably work long as you get the bolt pattern the same. Ok so here we are back again this time we're going to cover the HS2 singles and dual carburetors here, basically how to identify those and the difference between the singles of duals. On the HS2 the inch and a quarter, you'll notice that the mounting flange for the manifold is straight up and down as opposed to the HS4s which are diagonal. That's the one thing of course we talked about the screws only two screws as opposed to the three mounting screws they come on those. Also you notice the float Bowl on a single is on the opposite side on HS2, so looking from the back these all be on the left side. HS4 they're all on the right side okay now as far as the duels for the Minis and the inline Sprites or Morris Minors the main difference you have on these things to look for, is the thickness of the spacer plates you notice here it's a thinner setup it is on the Sprite. The Sprite uses like a big old fat one inch spacer on theirs in the back. The other minor differences are the linkages the Mini uses a narrower linkage in between as opposed to a wider one on the Sprites and also the float bowls they're mounted using those cases with these rubber grommets that go inside the float bowls here and they're notched different, to 20 degrees or 30 degrees. The minis actually use the 30 degree so you want to get the angle of the bowl when it's matted on the engine so it's pretty much level. It's only 10 degrees its not going to matter a whole lot less on that but you look kind of like to have that right where the Sprite sits a little different angle so they've set at 20 degrees. Other than that, they're really about the same you can interchange you can use this carburetor on that and that carburetor on here so it's just a matter of linkage and spacers. I think that pretty much covers it. Of course there's an old antique one here you see comes with a looks like it's a one-piece that's actually the two-piece manifold it's got a bolt on it, it has actually really really, it has an H carburetor here you tell by the bolts have a single bolt on it, and the cobwebs are going on in there. So it can be rebuilt but we don't like to you can actually convert this style over the H style to a more modern HS2 style, everything was about the same the linkage should be a little differently it can be it can be converted over so I think that's about it for the carb shop, hopefully I'll help you identify your SU carburetors from HS3844 the HS4, HS2 the singles and the duals. If you have any questions you always give us a call at the toll free number 800-946-2642, give me a call anytime I can help you out and you can look on the website for any carburetor kits you need or if you need a replacement carburetors we try to keep them all and stock. Thank you for your time until the next time in our next session, so long.